We have obtained many accreditations including the British Retail Consortium Packaging Certificate (BRC) and the NQA Environmental Management Award. 1960 - John McKenna becomes one of the first mushroom growers & composters in Ireland, and establishes JF McKenna as mushroom packaging manufacturers. 1980's - The business is incorporated as JF McKenna Ltd in 1982, and expands its packaging operation to include injection moulded polypropylene packs. 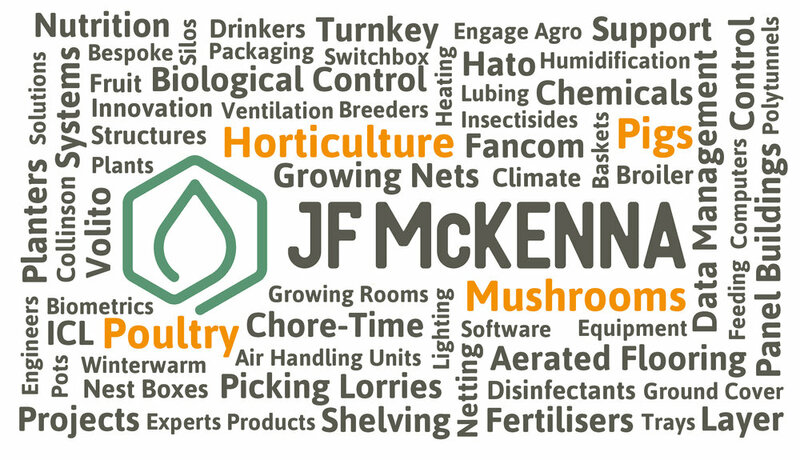 1988 - JF McKenna becomes a supplier of Fancom products to the mushroom sector - we are now the principal supplier of Fancom products in the UK & Ireland for our Mushroom, Poultry and Pig Sectors. 2017 - JF McKenna Ltd expands into poultry nest boxes and layer houses with the completion of the Bowen Project featuring two 16k aviary houses in the UK.